The monograph on Natasha Shoro is written and edited by her daughter Anushe Shoro, but this family connection, in no way belittle worth and credibility of the large format book published by Le Tropical Printers, Lahore (2018). The book includes essays by Roberta Carasso, Marjorie Husain, Meher McArthur and Dr Joanna Roche, along with sumptuous examples the artist’s works from 1990 to 2017. The author, Anushe Shoro, besides being the offspring of her subject, “is a writer, poet, and photographer who resides in Irvine, California. Aside from spending her days outdoors, chasing sunsets, and reflecting in nature, Anushe focuses on her career in the non-profit, education and psychology sectors”. 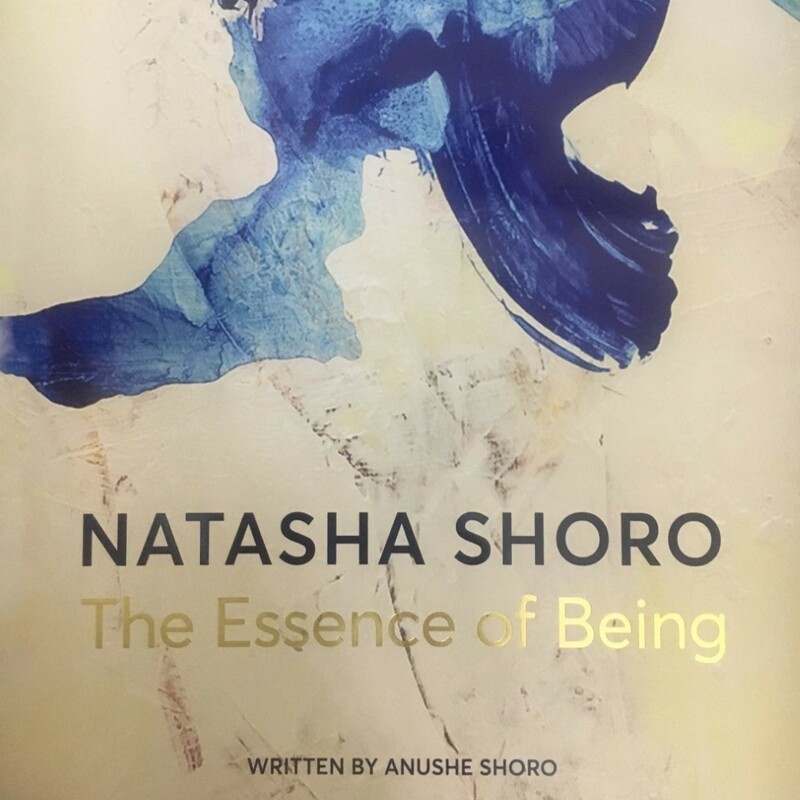 Word about the author on the jacket of book are not just random choices, since these provide clue and key to comprehend the art of Natasha Shoro reproduced in the book. Shoro was born in Ithaca New York, USA, and acquired her MFA from the California State University, USA in 2006. She exhibited mostly in the California, along with UAE as well as at the Canvas Gallery (2016). Details of her life inform that Shoro has been exhibiting since 1990. The book suffices a sufficient amount of example to know, familiarise and understand the art of Natasha Shoro. In most of her work, one witnesses flowing paint, streaks of colours – often sweeping imagery. On this style Anushe Shoro shares “When explaining her artistic process, Natasha frequently mentions the element of water”. The water or other fluids are essential in her art making, because these seem to determine the course of her final image. Splash, drip, trickle, drop, stain, sweep, are all there in her paintings, mostly mixed media on canvas. The simplicity in her imagery is reflected – rather repeated in the way author approached her art. Talking about the presence of non-figurative in her art Dr Joanne Roches explains “Abstraction is essential in our lives. The reality of our busy, and often painful, world needs an antidote. Natasha’s dreamy, loose acrylics offer more than just moments of hopeful cloud gazing; they encourage a pause to find an open space, and to take time to absorb our surroundings”. But which are our surroundings? Suburbs of California or the neighbourhood of Karachi? Actually, random application of paint in her canvases is connected to Abstract Abstractionism (in which “Female Abstractionist Expressionists in the first generation were marginal”, Arthur C. Danto), besides linked to free association of thought, propagated and practiced by Virginia Wolf. Through the layers of paint one can determine the circumference of a mind that seeks to arrive at a perfect solution. Affirming to this Marjorie Husain, another contributor to the monograph, extrapolates: “Natasha was fascinated by mark making technique and practiced calligraphy with appreciation”. This aspect of mark making, if on the one hand detected from her expressionist style, at the same instance, it is about her experiments with form, medium and material. Husain invoking Natasha Shoro’s early years in Sindh shares that “Natasha was inspired by the desert landscape in Sindh and was fascinated by the architectural settings. Since her first visit, the artist has returned to the village a handful of times and is always intrigued by the textiles, fabrics, and quilts, or rali: the colorful cloth villagers wear include bold patterns of beautiful applique wok and embroidery”. Her paintings in the monograph affirm this aspect, since there are links to her homeland found in her surfaces. But unlike some of our expatriate painters, she is not fussy and furious on her land of identification. May that be US or Pakistan; because for Shoro it is shore of internationalism, of accepted territory that would lead to the presence ad pursuance of her art. One wonders about the inclusion of poems by the author in the monograph, because these take away from the power of Natasha Shoro’s imagery, intense and vibrant; as expressed by Shoro “A journey of self-discovery involves an investigation of how these inside, outside spaces relate to my overlapping identity”. Evident in the woks reproduced in the book, because the work, no matter how far and disjointed, still holds a bit of attraction. It seduces viewers across the continent as it attracts a number of viewers eager to know the new development in her art. Despite of where you are, you can be a Shahzia Sikander, a Salman Toor, a Saira Waseem, a Nusra Latif Qureshi; still you are required to present your passport. But in the case of these painters one feels that the journey is two-folded and treacherous. Everyone who is painting belong to his homeland as well as to the wide wold of art. It seems that Natasha Shoro has opted for a grandeur republic of art, devoid of small issues such as local representation, recognition of imagery and association with a tradition – any tradition for that matter.